I am interested in all aspects of sequential decision making under uncertainty, from philosophical to practical questions. What a priori knowledge about the world is required and how do we have to explore to guarantee identifiability? Could there be a generic algorithm, able to learn the causal relation between any given sensors and acutators in any scenario? How can we tractably learn such models online, from a continuous, long stream of sensory data? How can such models be used for computationally efficient optimal control? Previously, I have mainly worked on Bayesian inference in dynamical systems (i.e. filtering). I have worked on general questions in approximate filtering, as well as methods exploiting the structure of specific problems, such as inferring the poses of all relevant objects and the robot manipulator from a depth sensor. Garcia Cifuentes, C., Issac, J., Wüthrich, M., Schaal, S., Bohg, J. We propose a probabilistic filtering method which fuses joint measurements with depth images to yield a precise, real-time estimate of the end-effector pose in the camera frame. This avoids the need for frame transformations when using it in combination with visual object tracking methods. Precision is achieved by modeling and correcting biases in the joint measurements as well as inaccuracies in the robot model, such as poor extrinsic camera calibration. We make our method computationally efficient through a principled combination of Kalman filtering of the joint measurements and asynchronous depth-image updates based on the Coordinate Particle Filter. 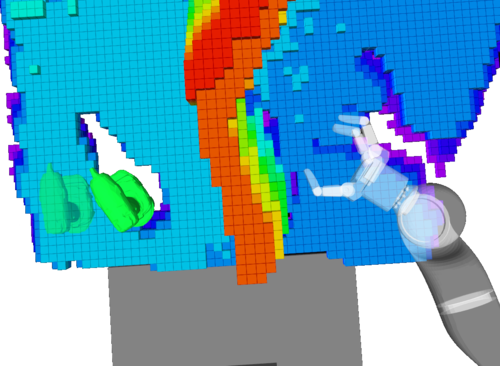 We quantitatively evaluate our approach on a dataset recorded from a real robotic platform, annotated with ground truth from a motion capture system. We show that our approach is robust and accurate even under challenging conditions such as fast motion, significant and long-term occlusions, and time-varying biases. We release the dataset along with open-source code of our approach to allow for quantitative comparison with alternative approaches. Wüthrich, M., Bohg, J., Kappler, D., Pfreundt, C., Schaal, S.
Parametric filters, such as the Extended Kalman Filter and the Unscented Kalman Filter, typically scale well with the dimensionality of the problem, but they are known to fail if the posterior state distribution cannot be closely approximated by a density of the assumed parametric form. For nonparametric filters, such as the Particle Filter, the converse holds. Such methods are able to approximate any posterior, but the computational requirements scale exponentially with the number of dimensions of the state space. In this paper, we present the Coordinate Particle Filter which alleviates this problem. We propose to compute the particle weights recursively, dimension by dimension. This allows us to explore one dimension at a time, and resample after each dimension if necessary. 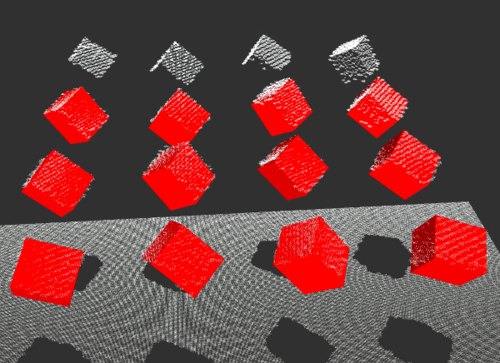 Experimental results on simulated as well as real data con- firm that the proposed method has a substantial performance advantage over the Particle Filter in high-dimensional systems where not all dimensions are highly correlated. 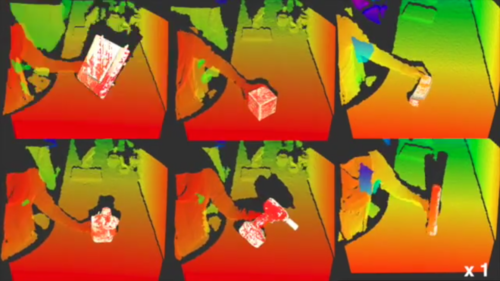 We demonstrate the benefits of the proposed method for the problem of multi-object and robotic manipulator tracking. Kappler, D., Pastor, P., Kalakrishnan, M., Wuthrich, M., Schaal, S.
Wüthrich, M., Pastor, P., Kalakrishnan, M., Bohg, J., Schaal, S.
We address the problem of tracking the 6-DoF pose of an object while it is being manipulated by a human or a robot. We use a dynamic Bayesian network to perform inference and compute a posterior distribution over the current object pose. 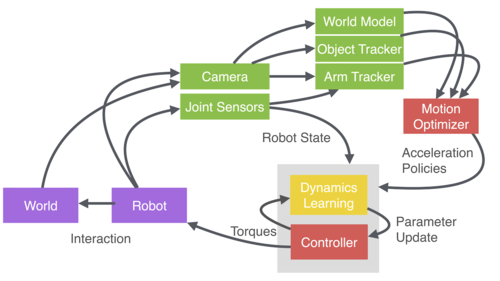 Depending on whether a robot or a human manipulates the object, we employ a process model with or without knowledge of control inputs. Observations are obtained from a range camera. 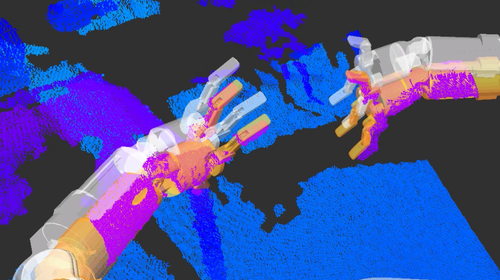 As opposed to previous object tracking methods, we explicitly model self-occlusions and occlusions from the environment, e.g, the human or robotic hand. This leads to a strongly non-linear observation model and additional dependencies in the Bayesian network. We employ a Rao-Blackwellised particle filter to compute an estimate of the object pose at every time step. 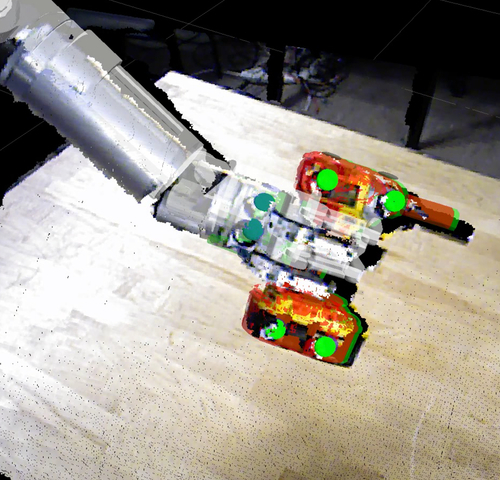 In a set of experiments, we demonstrate the ability of our method to accurately and robustly track the object pose in real-time while it is being manipulated by a human or a robot.